Plot: In 1987 a recent college grad sees his European trip go up in smoke when his parents can't cover the cost. Forced into a menial job at a local amusement park, he finds out more about life and love than he would ever imagine. The year 1987 a recent college grad sees his European trip go up in smoke when his parents can't cover the cost. Forced into a menial job at a local amusement park, he finds out more about life and love than he would ever imagine. this movie is a lovely young comedy film that teenage's can enjoy. Same old summer love movie. This time its with Jesse Eisenberg trying to get in old Kristin Stewart's pants. Shouldn't have been as hard as he made it out to be. Overall good watch. Very little re-watch material. A newly graduate, James, found a summer job on theme park called "Adventureland" where he meets new friends, cool ones, nice ones, and those who have issues with each other. There he experiences bad working place and surprisingly, the other end of the spectrum. *** First thing, I am not sure if this movie was supposed to be a drama, or a comedy, or a romantic one, cause I didn't see any of these actually established. The actors are good, just good. The story is very simple, and got nothing special for the viewers. But this movie is actually workable, I must say. Watch it! Why not? This movie seems to hold relevance to modern day when millions are looking for work or hate their job. This also serves as a nostalgic piece for those who remember working as teenagers. The plotline is simple. 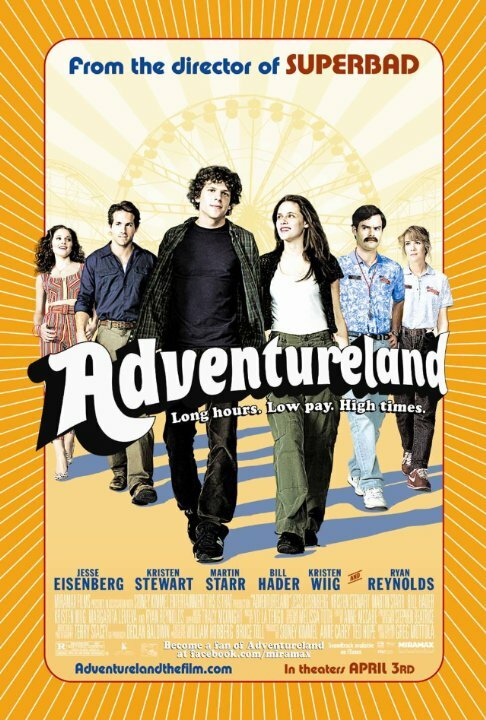 Jesse Eisenberg goes to look for a summer job, only to get stuck with a job at a local carnival known as Adventureland. The rest could've gone downhill with slapstick and gross-out gags that plagued 90's raunch comedies. But from experience, Greg Motolla knows you can get a laugh from the real. He chooses to create laughs from situations that every awkward teenager goes through and as a result, it makes the moments more endearing. No posts have been made on this movie yet. Be the first to start talking about Adventureland!